Arr, mateys! 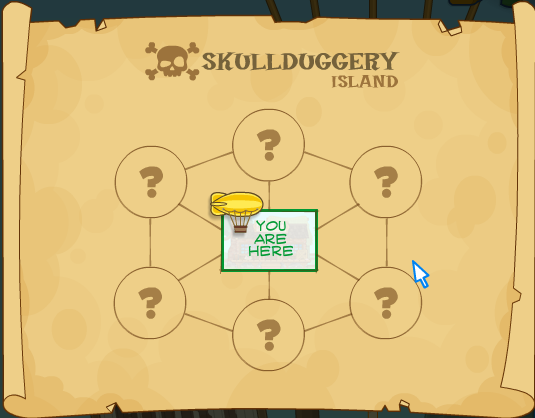 Are you ready for some swash-bucklin' action on Poptropica Skullduggery Island! This is an exciting quest in which you are trying to eliminate the horrible pirate, Captain Crawfish. But first, you must collect pieces of a map from five different islands, fight evil sea monsters and wicked pirates, collect Doubloons to buy new ships, and prevent from going bankrupt! Arg! Quit yer bellyachin' an git back to work on this island! Okay, I'll switch from pirate mode now. The first thing you should do once you land on this island is go all the way right, past the bridge. Hop off the rocks, and then go left under them until you reach the water. Go left, and you'll see a shiny speck just beside the water. Collect it. It's a Doubloon, the currency of choice on the high seas. Go right again to get back. Then hop onto the bridge and go left. Keep going until you reach the general store ("Stinky Tim's".) Go inside and use the coin you got earlier. You will buy the feed with it (what the..?) This may sound like a terrible trade, but keep going and see how you're wrong. 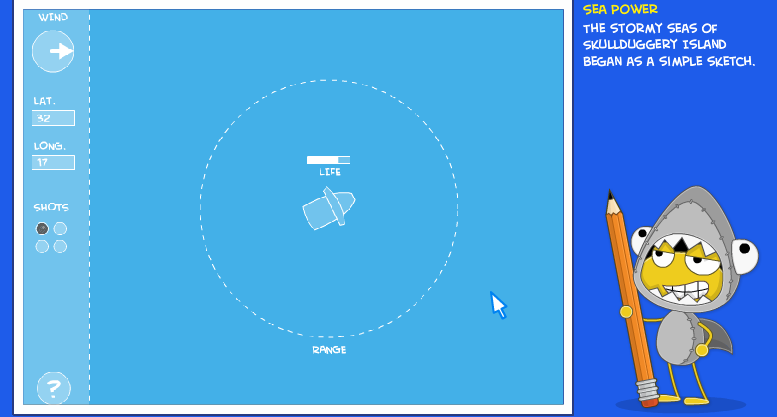 Collect the broken mirror on top of the shelf at the very right (click on it.) Exit the store and go left until you see the man with the chickens. Talk to him and he will tell you that he is very poor, and he can't even afford to feed his animals. Give him the feed. He will be very grateful, and he will give you one of his chickens as a reward. I know, lots of weird items on this island. Take this and head back across the bridge. Talk to the guy near the ruined corn plants. He cannot feed his family because pests are eating his crops. Give him the chicken, and it will start eating the pests. He will give you the blue candle as a reward. Take it to the rocks at the far side. Jump up and make your way to the mansion on top. Go inside, and to the right. Talk to the first man, the new governor (the old one is dead.) He will show you a letter from Governor Ridley (before he died.) But the middle part is completely gone! How strange. But it won't remain a mystery anymore... Give him the blue candle after you are done talking to him. The text was written in invisible ink! Read the document, then close it. The governor and his assistant will talk to you for a while. Then, you can go outside, and past the bridge. Keep going left until you reach the defense tower (you can't miss it; it has cannons sticking out of it.) Climb on top of it, and use the telescope. Search to the left of the starting point to find the damaged raft. Search close to the water, and when you see it, click on the mirror in the bottom left-hand corner to signal it to shore. Hooray! The raft is coming. When it arrives, you'll talk with the merchant there. He will give you an account of what happened to him at sea. Then he will give you the raft. Read the message that appears. The icon in the bottom left-hand corner will give you some info about your current ship. Read it if you want. Currently, you have some cargo to get yourself started. You can only hold 20 cargo for now. Then read the info below. The old sailing interface -- sketch. Thankfully, there's no wind to deal with in the actual one! Collect salvage when you spot it (this is abundant in between Parrot Port and Golden Harbor.) It will give you more cargo and Doubloons. You'll find many whirlpools south of Bouffant Bay. It also usually has storm clouds obscuring most of it. Storm clouds are also in large numbers near Parrot Port. If you have more than two cannon shots, then it's smarter to attack! Clicking fires your cannons, and if you run out of shots you'll have to lay idle for a while until your cannons recharge. It's not necessary to sink the ship every time; all you really have to do is keep them off your tail until you dock. If you damage a ship completely, it will leave behind some salvage that you can collect. But if you don't have more than three cannon shots, I'd advise you don't stick around for this! Otherwise, it's a good chance you'll be sunk. Sea monsters usually have lots of life, so I advise you run away unless you have the highest amount of cannon shots (five.) Also, they are much bigger, so one hit from them is enough to wipe out half of your life! Your ship only has a certain amount of cannon shots (or hits by a sea monster) it can take. If you run out, you'll sink! When this happens you will lose part of your cargo and your money, and you'll be sent back to the dock you came from. Docking at a port will let you recharge your life. You'll find many pirates in the Golden Harbor -- Pirate Outpost area, and sea monsters are abundant around Dragon Cove and Bouffant Bay. This makes sense, since the new island you discover after collecting all the map pieces is guarded by pirates. This is in the bottom left-hand corner of the map. I have one tip for you: don't go out of your way to find some salvage while you are in this area! ...then starting again (basically, just go clockwise through the islands.) At Dragon Cove, you can get a new ship. I recommend taking one out the moment you have the chance. You'll get a discount on a ship because you'll be trading in your old one. Basically, all you have to do is buy the max amount of the lowest priced cargo (you will have to start at Bouffant Bay for this to work) at one trading post, then sell all you have at the next trading post, even the salvage you've collected. The first time you trade, this doesn't work so well, but just sell everything you have anyway. Then buy the highest amount of Medicine. You now have more than 100 Doubloons to work with! If you follow my order (above), when you buy the lowest priced good at one place it will be selling for the highest price at the next one. If you follow my instructions, you'll breeze through the different ships and islands! There are times when you just don't have enough money to fill your cargo, but that's fine as long as you're carrying more than two-thirds of your possible cargo space. There's another way to complete this island: every time you reach Golden Harbor, take out a loan. Then return it the next time you come back. This way is quicker but you have to be careful of loan-related glitches. It's also really easy to forget to return loans, which is bad because the debt starts to pile up. where P is the loan amount and d is the number of days you keep the loan, this formula gives you the amount you'll have to pay back. Since the amount is rounded up each day, the calculator to the right can't use the easy formula, but anyway this is a rough idea of how simple interest works. Bouffant Bay The first thing you should do after arriving here is to hop up onto the platform above you with the man with the rifle. Go to the left, and then pull the lever there to unlock the winch. Get onto the platform, slide down, then talk to the guy there (but wait until it goes down all the way!) He will tell you his wife can give you a clue. Go right and talk to the pirate. He'll tell you he can't find 312 Hanging Fern Way. Of course he can't! There's no such place. But remember this number: 3-1-2. For now, just go right and hop onto the barrel near the Trading Post. Then get onto the lamppost. From there, jump onto the sign, and then onto the balcony of the next building. Talk to the lady there (she's the guy's wife! ), and she'll give you a clue. Hop off the balcony and under the three hanging ferns. Then hit the third (3) one, the first (1) one, then the second (2) one. Ta da! The map piece flutters to the ground. Parrot Port Go into Petey's Pirate Pub and jump on top of the barrels to the left. Then jump to the right and onto the platform. Hop onto the next platform to the right and collect the crackers. Then get outside and go to the left. When you reach the parrot on the barrel just left of the Trading Post, click on him. He'll tell you to jump in the sea before looking for him, and you're going to do just that! After you're out of the sea, jump on top of the Trading Post sign. Then jump up. Talk to him. Following the parrot's directions, jump onto the roof. Go to the right, then jump onto the next rooftop. Clog the vent by jumping on it. Then hop off and go to the right of the roof. Jump onto the tree (you can't reach this spot from the ground.) Talk to the parrot. Whoo! This sure is taking long! But you'll be rewarded soon... Jump off and go to the left of the island (stopping about where the dock begins.) Jump onto the platform, then onto the bigger one. Climb up the tower (jumping onto the crates first), and talk to the pirate. The use the crackers. The parrot will come flying. Speak to the pirate, and he'll give you the map piece as a reward. Golden Harbor You'll notice that there are five lamps scattered throughout the island, and that you can light these by clicking on them. Sometimes, lighting one can turn another one off. Go to the draped archway to the left of the bank. The symbols above it will tell you which lamps to light. But you need to light them in backwards order, otherwise they will not all stay lit. You'll need to activate the fourth one, the second one, and then the first one. The fourth one corresponds to the one to the left of the bank. Then go left until you reach the red awning near the trading post. Jump onto it, and it will launch you up to the next ledge. Then turn on the light. Jump off, and go to the left until you reach the first one, near the lady in purple. When you turn this one on, you'll see the parchment appear in the archway. Go over there and grab it. There's another order you can do it in: one, four, two. But I decided my way was easier. Pirate Outpost Once you arrive, keep going left, past the skull, through the water, and finally on the mini island. Jump up to the highest platform, then jump onto the winch to the right. Jump off of it and onto the grassy platform with the guy in orange. Go right, past the head of the skull, and onto the tilted platform (make sure to jump over the gap!) Then jump onto the cannon, and next to the left. Get a little under the building, then jump up. You are now outside Corsair Cannonry. Jump onto the roof of the building, then climb to the leftmost roof area. Jump off, and go straight down when you spot the skull-and-crossbones flag. You'll collect the Cannon Starter Kit. Then go back to Corsair Cannonry and go left, then jump to the small platform. Push the barrel of explosives (yikes!) off the platform, then go down with it. Push it off another time, and jump off again. It'll land in the water. Jump to the left of the barrel, then push it directly under the golden tooth of the huge skull. Then go back to the tiny island. Launch the cannon closest to the ground, and it'll hit the explosives. BOOM! It explodes and shakes the tooth loose and... what's that? It must be the fourth map piece! Go over and collect it by first jumping up near the left of the skull, and then jumping to get it. This needs to be done because you can't jump as high in the water. Dragon Cove Go right, and into the water. Jump across the barrels and onto the statue. The tail will pop up. Jump off and collect the mallet. Swim right and onto the platform. Then jump again and talk to the guy fishing. He's having a tough time finding fish. Help him by pushing the crate he's on until it just touches the barrel. Then use the mallet. The fish will jump up and he'll catch one. Then you'll get the map piece from the mouth of the fish. Jimmy Rigger The first ship you buy. Sea Sultan Now you can spend your money on hiring people. The Koi Now that's what I call power! Phoenix Warbird Finally, a warship that can take on the vile Captain Crawfish! Increases your cargo capacity by 50% (ex: 20 cargo -> 30, just do cargo multiplied by 1.5). Reloads your cannons twice as fast as before. Repairs a ship without having to dock it (slowly, though). *See The Map Pieces for info on how to get here. How the Creators made the mighty Phoenix Warbird! Recommended This one is a little strange, but it's the one that works the best. When you spot Captain Crawfish, fire at him until at least one-fifth of his life is gone. Then kind of get away, and then make a full circle and crash into him head-on. Both ships will start losing life rapidly. This works, but you should also keep shooting at him non-stop to speed up the process an make it easier on you. Get in front of Captain Crawfish's ship, and sail in circles with him behind you. Both ships are more comfortable firing to the back of the ship (this doesn't apply to you if you're fighting him with the Steaming Fury.) This way, you have a shooting advantage because he is behind you, but he will have more trouble with this. This is when the cannon shooter you hire in Pirate Outpost comes in handy (if you have him, it's wiser to stay more ahead of Captain Crawfish than you usually would.) If you do this a little north-east of Skullduggery, and keep firing repeatedly, you'll sink him in no time! Once you've beaten Captain Crawfish, return to Fort Ridley. And then get ready for some heart-stopping action! Follow the directions below. Now that Captain Crawfish has been removed from the waters of Skullduggery, the governor's treasure can be returned to Fort Ridley! Go there again and go all the way right, across the bridge. Go to the far right and climb up the rocks to the governor's mansion. Go inside and talk to the new governor. He will give you a map and a shovel that can dig through curses! So that's why Captain Crawfish hasn't gone after the treasure yet! Sail back to the island of Skullduggery. Go right, jump off the dock, and swim to the island. If you look at the map the governor gave you, you'll find you have to walk six paces east of the flag for the treasure. 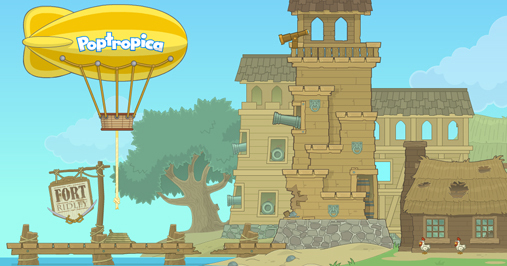 Obviously, you can't count paces in Poptropica, but just go to raised (sort of) area just left of the palm tree. Then use the anti-curse shovel to get that treasure! After two hours and four feet, you'll finally have the treasure, but what's this? I don't believe it! It's... CAPTAIN CRAWFISH! I thought I had sunk him! Listen to the pirate and learn that the man who supposedly served the governor was Captain Crawfish's loyal servant! Oh, no! But then the ground starts shaking and then it's raining cannon shot! Oops! That's your own cabin boy... Well, you'll see Captain Crawfish's ship sink and then you'll get set to leave. Once the dust has cleared, the governor will give you part of the treasure: a solid gold medallion!